What do I do with all of my students’ writing? I asked my graduate students to reflect on their experience in the “Teaching of Writing, K-12” course I taught last semester. I asked them to share three things they learned about writing from taking the course, two insights they gained about the teaching of writing, and one question they still have about writing or the teaching of writing. One student asked me how I keep suggest she keep all of her students’ writing organized throughout the year since the paper was piling up by the end of December. 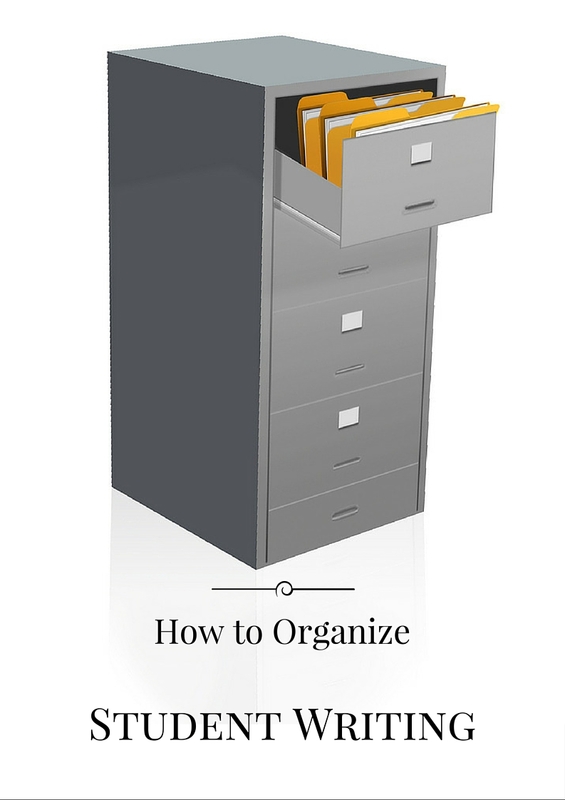 In an effort to answer her question, and to help others who feel inundated with paper, I want to share a few organizational ideas. If you work in a 1:1 classroom, I’m sure you have a system for saving all of your students work since it’s electronic. However, many kids are still writing in traditional notebooks and drafting in booklets (primary grades) or on loose-leaf paper/legal pads (upper elementary/middle school). After one unit of study, a writing folder is comfortably filled. By the end of two units of study, it’s over-stuffed. Purge writing folders monthly: Just as you have students clean out their desks every couple of weeks, students need time to purge their writing folders at the end of each unit of study. (My students taped mini-charts into their notebooks and turned their drafts in with their final piece of published writing. Therefore, their folders weren’t usually filled with much more than their drafts.) If you have kids who struggle with throwing things away they don’t need, then form a small group to help them learn what should be saved and what can be tossed. At the end of each unit of study, my students would publish their writing in a manila folder as pictured here. Turn in all drafts when publishing: I’m a process person. I like to see how a student’s final published piece differs from his earlier drafts. Therefore, when my students published, they’d staple their published piece above their previous drafts. Their first draft would be on the bottom of stapled pile of papers on the inside right side of their manila folder (see photo at right). Not only did having all of their drafts behind their published writing help me to determine what kinds of revisions they made, but it also provided me with a way to hold on to their drafts in one place. File published writing folders: I allocated two drawers of a filing cabinet for student writing. Each student received a hanging file folder. After every publishing celebration, students filled out a reflection, which would be placed inside of their manila folder. Then, I’d hang their manila folders — with their published pieces, drafts and reflections — on a hallway bulletin board until the next piece of published writing was ready. Once the pieces came down from the hallway bulletin board, I stored them in my filing cabinet. NOTE: I never allowed any of my students’ published writing to go home before June since I feared I’d never see it again. Often, in later units of study, my students would want to reference a piece of published writing they did earlier in the school year. Having all of their writing in my filing cabinet allowed this to happen quickly rather than having to go home to search for it. Keep old writer’s notebooks: Every time a student finished a writer’s notebook, I placed their filled-up notebook in their hanging file folder in the filing cabinet. Again, having older notebooks in the classroom allowed students to access their earlier writing whenever they wished to in another unit of study. Send home or pass on writing at the end of the school year: I allowed my students to self-select one published piece of writing — from their hanging file folder — to pass on to their future teacher in their portfolio. Their old writer’s notebooks and the rest of their published writing went home with them during the final week of the school year. If you’re not already in the habit of saving student work, then now is a great time to start! You’ll want to start saving student writing now so you can use it as mentor texts with your future classes. However, it’s too time-consuming to save all of your students’ writing. I suggest picking three to five students whose notebook entries, in-process writing, and published pieces you wish to save for each unit of study. Either photocopy their work and save it in a mentor text file (for a given unit of study) or use a scanning app (I like Scannable.) to save their writing to your hard drive or to Evernote. For more tips about creating a system for saving student work, check out pages 151 – 152 in Day by Day: Refining Writing Workshop Through 180 Days of Reflective Practice. How do you manage all of the writing your students do? Please share your tips for not being buried alive by paper when you leave a comment below. 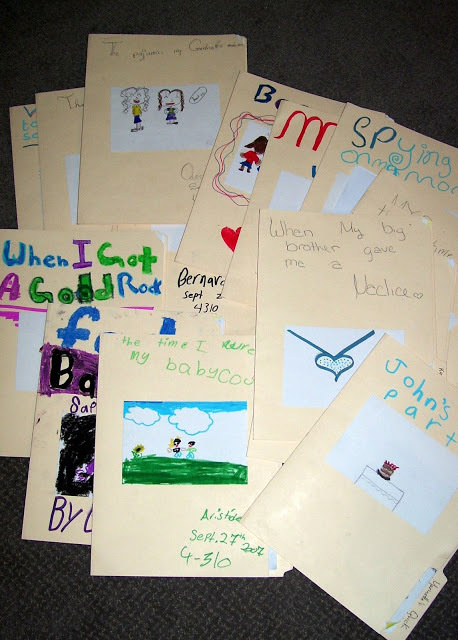 As one of writing coaches at my K-5 school, we implemented a bldg-wide writing binder that is passed on from year to year and follows the students from teacher to teacher. Starting in 2nd grade, all of the student’s writing pieces are stored and organized by the 3 text types with divider number 4 kept for writing tools. Each writing piece is stapled together with the student’s blueprint (our graphic organizer), the text type’s writing checklist, and any supplemental reading/articles the student may have used to gather details/evidence from. Many of our teachers have the students refer back to a previous year’s writing piece to work on mini-lessons or to remind kids of a skill or strategy that was taught the year before. The writing binders do not go home in summer. Parents are invited to view their child’s work during PT conferences and other parent events at the school. The students take great pride in their writing binders and can’t wait to finally take them home at the end of 5th gr. Seems like a great system! Thanks for sharing.